Can hold 1-6 decks. Lightweight and easy to carry. Wide card, narrow card, playing card, and plastic cards are all suitable. for it free. Orders placed on weekend will. checkout, it can't be changed once order completed. If the goods are faulty then the standard statutory rights apply. 4 White Plastic Wooden Effect Lawn Border Edge Garden Edging Picket Fencing Set. Try your luck with the Lucky Ace Clear Weighted Wedge Casino Card Shoe Slider / Dealer. Up for sale is a New Excalibur Dealer Shoe. Bicycle Poker Setseems complete. 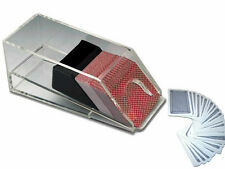 This blackjack discard tray is made of heavy duty clear acrylic. - Casinos use similar discard trays on all their blackjack tables for the dealer. 1 Piece Discard Tray. Due to different light and different angle,the actual object is little different from the picture. Harley Davidson Acrylic Blackjack Card Dealer Shoe and 5 Decks of Cards-Mint!!!! Harley Davidson Acrylic Blackjack Card Dealer Shoe. 5 Decks of Cards. Up for sale is the above listed. This shoe and the cards are in mint condition. They were used periodically to pass an evening and now my loss is your gain. Made from heavy duty acrylic. Type: Dealer Shoe. 1 x Dealer Shoe. - Color: Black. Due to the light and screen setting difference, the item's color may be slightly different from the pictures. - Capacity: 1 Deck. Dealing shoe, discard tray and cut cards are all similar to the ones found in casinos. (5) Poker size cut cards in black color. (1) 8-Deck discard tray. (1) 8-Deck dealing shoe. We rarely make mistakes, but when we do, we will fix it them. Vintage Bridge Casino Dealer Metal Shoe With All 52 Cards Ships Immediately! Shows some wear, cards show some yellowing due to age. Ships immediately! Our 8 Deck Casino Style Blackjack Card Dealers Shoe can make anyone look like a pro. Our casino style dealer shoes are constructed with a heavy clear acrylic material with smooth edges. Blackjack dealing shoes are used to hold the cards that the dealer and players will receive. Suitable for Baccarat or Blackjack. 8 Deck Dealer Card Shoe made from Wood Veneer. Black 1-8 Deck Blackjack Dealing Shoe Discard Tray Poker Card Casino Professional Dealer. Type: Blackjack Dealing Shoe. 1 x Blackjack Dealing Shoe. - Constructed with thick, durable clear acrylic. - Material: Acrylic. Type: Discard Holder. 1 x Discard Holder. Due to the light and screen setting difference, the item's color may be slightly different from the pictures. - With a heavy roller, more stable. Capacity: 1 Deck. Type: Dealer Shoe. 1 x Dealer Shoe. Due to the light and screen setting difference, the item's color may be slightly different from the pictures. - Push the card forward by thumb, turn on the switch then card will be launched by flywheel. 1 Piece Electrical Dealer Shoe. - Material: Plastic. - Push the card forward by thumb, turn on the switch then card will be launched by flywheel. Vintage Bridge Casino Dealer Metal Shoe With All 52 Cards Green King Ships Fast! Wooden Playing Card Dealer Shoe With Rollers. Overall in very good condition. Removable plastic tray for easy unloading. Item model number: 10-37581-A. Requires 4 AA batteries (not included). Batteries 4 AA batteries required. Capacity: 1 Deck. - Material: Acrylic. 1 Piece Dealer Shoe. - Color: Black. "Le Banquier" sticker attached as shown in photos. Highly-lacquered/glossy wood card shoe with a burl-wood look and black sides & handle. 8 Deck Discard Tray. Play and deal just like they do in Las Vegas. Clear Acrylic. Black 1-8 Deck Blackjack Dealing Shoe Discard Tray Poker Card Casino Professional Dealer. 1 Piece Blackjack Dealing Shoe. People always bought together with. - Color: Black. "Bee" No. 92 Sahara LV Casino Cards NEAR MINT. Solid Oak Construction. Playing Card Shoe Dispenser. Blackjack Poker Gaming. Vintage Bridge Casino Dealer Metal Shoe With All 52 Cards Chicken Ships Fast! Vintage Bridge Casino Dealer Metal Shoe With All 52 Cards Flowers Ships Fast! Vintage Bridge Casino Dealer Metal Shoe With All 52 Cards Blue King Ships Fast! Vintage Bridge Casino Dealer Metal Shoe With All 52 Cards Duck Ships Fast! MACRYLIC DEALERS SHOE. Condition: Excellent Condition with Box.